According to the LA Times. cable boxes are the second largest household consumers of electricity, only exceeded by air conditioners. 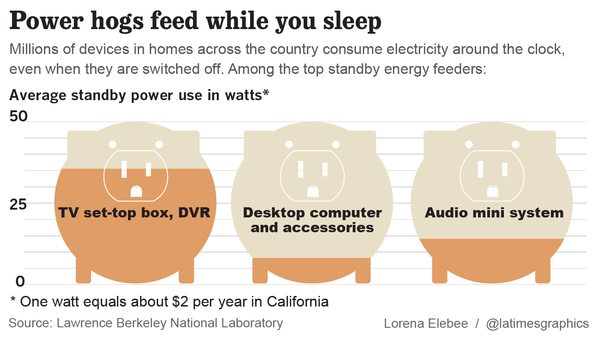 Up to 500 watts of electricity per device, even when they are supposedly turned off. Bet you didn’t know that. 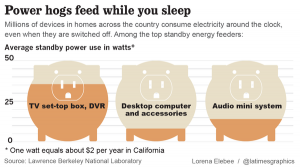 The seemingly innocuous appliances — all 224 million of them across the nation — together consume as much electricity as produced by four giant nuclear reactors, running around the clock. They have become the biggest single energy user in many homes, apart from air conditioning. During a call to my local provider Comcast, the customer service rep told me there was no one at Comcast who could answer how much electricity was used by each of the boxes the company rents to me. I would have to ask my electricity company. But oh, yes indeed, the boxes never turn off so long as they are plugged in. “They are just like a desktop PC, or an alarm clock,” she added. Well, no not exactly according to the Times story, more like a washing machine that is running 24 hours a day. Apparently there is a relatively inexpensive fix that the cable companies could provide, the same ones installed in the aforementioned PCs, in smart phones and other energy efficient electronic equipment. If only there was consumer demand. Consumer demand would, of course, require consumer knowledge, which so far has been in short supply. Here’s hoping the media pick up on this. Lest anyone have any illusions about the nature of our proposed intervention in Syria – “moral outrage” or “defending international law” – this is about oil. As the FT points out (whence the clever part of the title of this post in quotes), the world’s major energy producers are facing off over Syria, with Russia and Iran on the one hand, Saudi Arabia and the US on the other. Influence in one of the world’s most unnaturally important regions is at stake and the consequences are very real to the world’s major economies. Thanks to technological advances in “fracking,” the share of US oil consumption represented by producers in the Middle East has fallen from a high of 60% less than ten years ago to 40% today, and is projected to decline even further in the next decade, perhaps even to inconsequential numbers. The gas in your automobile is now almost as likely to come from North Dakota as North Africa. That said, we still import a critical share of our oil from the region today and Europe, Japan and our other major trading partners are likely to be dependent on the region’s output indefinitely. The price of oil on the international market has risen some 20% in the face of the degrading situation in Syria, from below $90 a barrel to $109 this morning. Were it not for fracking in the Bakken regions of North Dakota and Montana helping to increase supply and keep a lid on prices, the price of a gallon of gas might be much, much higher due to this crisis. For all the talk of humanitarian interventions, our proposed military intervention is not the sort of activity we generally consider anywhere but the Middle East. There is plenty of outrageous activity around the globe to choose from if we truly were acting as the world’s policeman. Oil is the lifeblood of developed economies and the vast majority of it comes from the Middle East. This is about protecting our influence and preventing the spread of instability to the oil producing countries. You can forget all the other arguments. The U.S. is well on its way to ridding itself of a decades of dependence on foreign oil. Given that our need for oil has played a part in most of the ugly and costly military entanglements we have gotten ourselves into the last 50 years, I can hardly imagine any better news. From Iran to Venezuela, with stops in places such as Iraq and Nigeria, the US has embedded itself with oil-producer governments in places we would have best kept our distance from. NBC News starts a four-part series examining how fracturing, or “frakking,” has opened up the production of vast quantities of domestic oil and gas. Communities from West Texas to North Dakota are witnessing the equivalent of a new gold rush. Combined with reduced demand through conservation efforts, our demand for foreign oil has declined precipitously in the past 3-5 years. The development of fracturing technology comes at some environmental cost and the arguments are already contentious. But to my mind, until we move away from our economic dependence on carbon-based fuels, I would rather have domestic battles over environmental problems than be compelled to engage in both covert and “hot” military ones to protect access to needed energy. Congress adjourned for the year on Friday, failing to extend the tax break that’s drawn a wide variety of critics on Capitol Hill, including Sens. Tom Coburn, R-Okla., and Dianne Feinstein, D-Calif. Critics also have included environmentalists, frozen food producers, ranchers and others. The ethanol subsidy was widely promoted as a means of promoting energy independence as corn was a domestic product that could replace a meaningful percentage of the oil we purchase from the Middle East. What the subsidy turned into was a crass subsidy of agribusiness that sparked a massive mis-allocation of capital and land use and caused a spike in domestic and global food prices as well, corn being a principal ingredient of both the US and global diets.